For those of you that don’t know, my name is Char Vine and I sustained a spinal cord injury in 2000 from a snowboarding accident that left me paralyzed from the waist down and confined to a wheelchair. Over the last six years, I have been hospitalized over a dozen times from complex spine complications that ensued from hardware that was installed into my back. By 2016 my body had become quite deformed and my spine had degenerated so severely that some of the hardware pulled out of my spine and started causing great damage inside my body. It left me bed bound and helpless for months. I opted for a high risk, extremely complicated surgery at the end of December 2016 to try and give me some quality of life back. They rebuilt my spine and fused me from my shoulders to my pelvis. It was a great success and my work ever since has involved a variety of therapies, five days a week to get my body back into a Straight Up position after being deformed for so long. The doctors estimated recovery to be at least a year and my progress has been slow and steady. I’m gaining back strength and movement everyday! But the surgery also left me with less mobility than I previously had in regards to twisting and bending that I can never regain. Now, because of the long length of the fusion, it is detrimental to my body to take my wheelchair apart to put it in my car like I used to. The last several months I have been employing daily outside help to get me to appointments and to run errands. A vehicle with a dropped floor and ramp is my need to help me get me from place to place independently and move more efficiently. These converted vehicles are quite expensive on top of my out-of-pocket monthly rehabilitation and therapy expenses. I am reaching further into the community for help with raising some of the money to get me through this life challenge and to help keep me moving Straight Up. During these challenging years my ability to earn had been negatively impacted and my design business has since dissolved. My plan is to return to work next year but an efficient vehicle is necessary to make that happen and still move forward in my recovery. 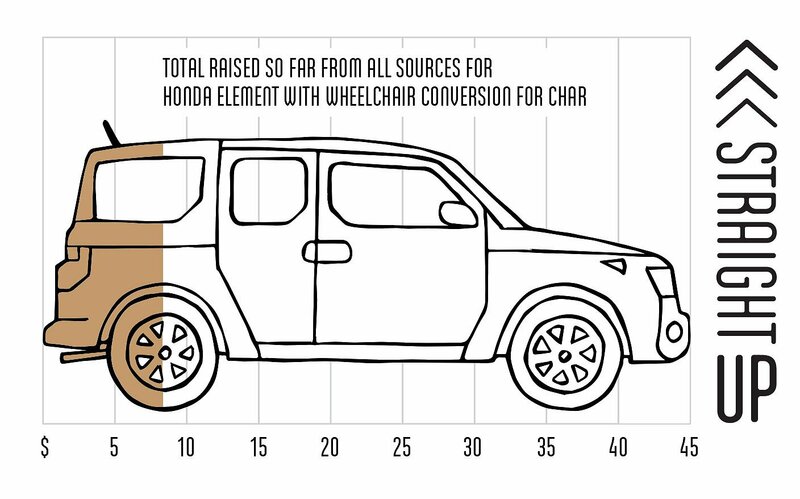 I’m shooting for the moon and setting a goal to raise $45,000 to fund a used Honda Element with a WAV Conversion and necessary modifications that will last me the next 10-15 years (see a video of it here: youtu.be Can you help me get closer to being independent again? Thank you so much for supporting me in my recovery journey. It has been a long challenging road and I would have never gotten this far without the support of so many. I’m so grateful to have this second shot at my life. I’m really excited about the future and for what’s to come! Any help you can extend out would be greatly appreciated, Straight Up!